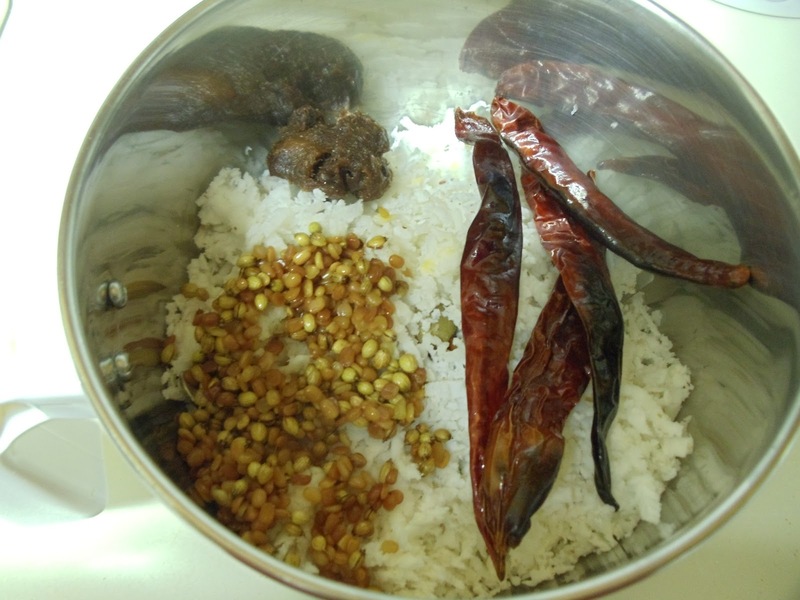 Beans Sukke is a simple Konkani dish. This is a coconut based dry curry. I got this recipe from my mother. Wash and cut the beans into bite size pieces. Then cube (small sized) the washed and peeled potato. To Prepare Masala: Fry coriander seeds and urad dal in 1/2 tsp of oil, until it turns light brown. Allow it to cool on a plate. Now grind grated coconut, jaggery, roasted red chillies, tamarind, salt, roasted coriander seeds and urad dal, to get a coarse mixture. Add little water so that all the things come together. Don't make the masala very fine. Now take a kadai and heat oil. Add mustard seeds. Once it starts to splutter, add curry leaves. Then add the chopped potato and fry for a minute or two. Then add chopped beans and mix well. Let it fry for 1-2 minutes on a medium flame. Then add enough water and allow them to cook. Once the beans and potato are cooked upto 75% , add in the ground coconut masala. Mix it well. Add little water, if it is too dry. Check for salt at this point. Allow the veggies to cook further in the masala (this might take 4-5 minutes on a medium heat). Adjust the final consistency of the dish. You can make it dry or retain little moisture. When done, turn off the heat. Beans Sukke is ready!! Serve it hot, as a side dish to rice and dal. Above measurement serves 2-3 people.